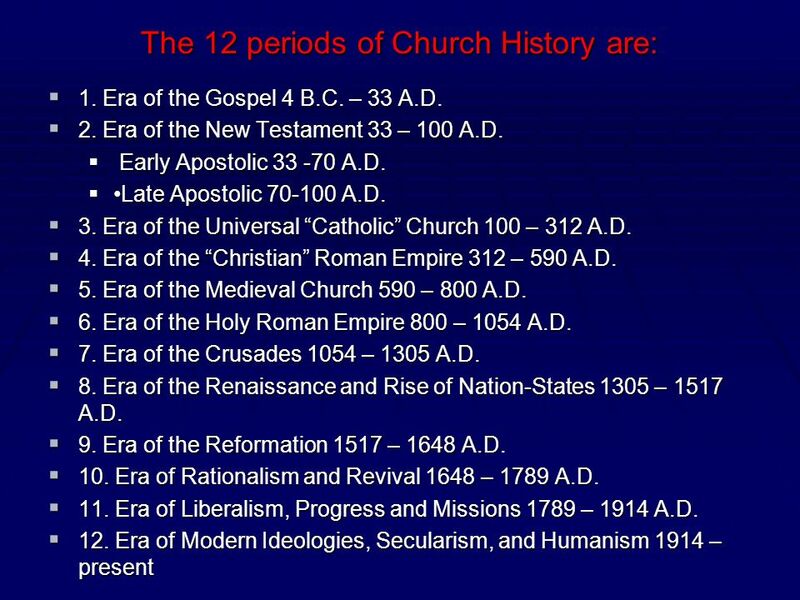 In religion, this era generally moved people: away from God and toward humanism. from Bible-centered authority to man-centered authority. 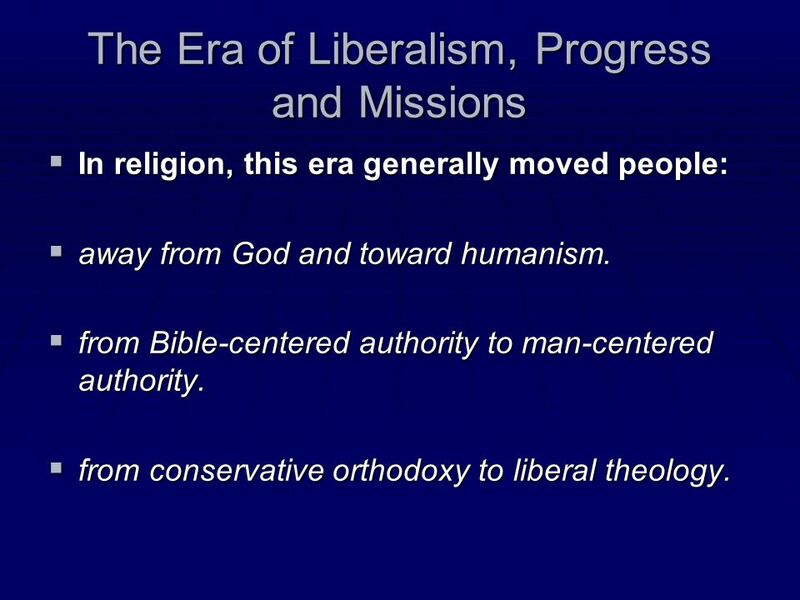 from conservative orthodoxy to liberal theology. 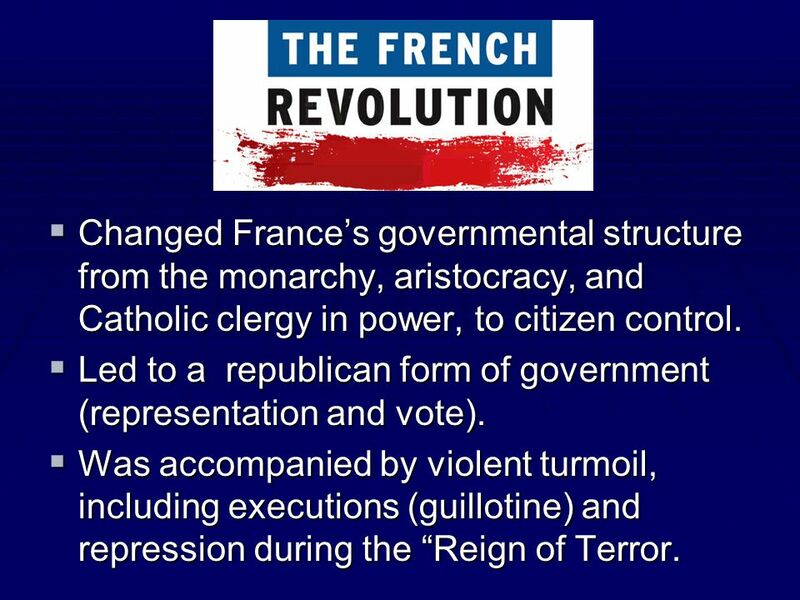 4 Changed France’s governmental structure from the monarchy, aristocracy, and Catholic clergy in power, to citizen control. Led to a republican form of government (representation and vote). Was accompanied by violent turmoil, including executions (guillotine) and repression during the “Reign of Terror. 5 Included warfare involving every major power in Europe. Led to Napoleon Bonaparte becoming dictator in 1799 and eventually proclaiming himself emperor in 1804. 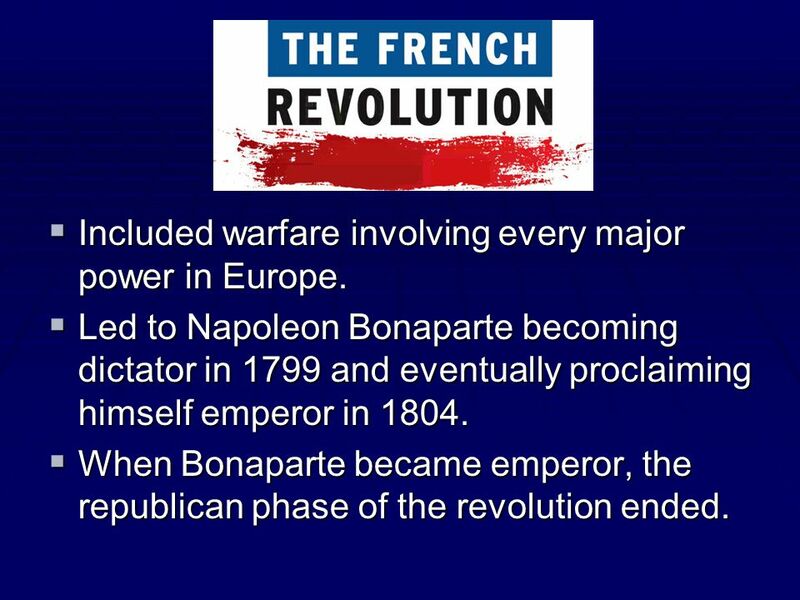 When Bonaparte became emperor, the republican phase of the revolution ended. Desire for liberty among the masses. Louis XV had led France to the verge of bankruptcy. Inequality in the tax system. The Roman Catholic Church, the largest landowner in the country, placed a heavy tax on crops. Therefore, the poor became desperate. Widespread famine and malnutrition. 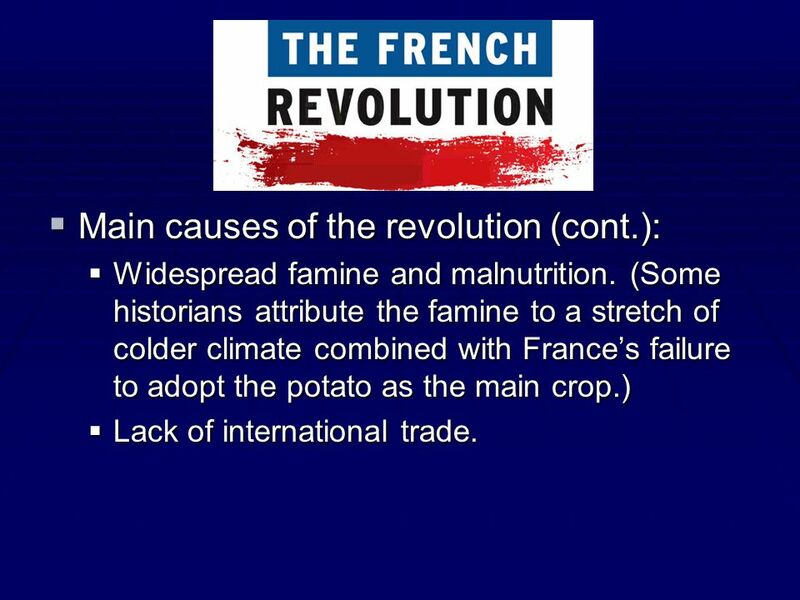 (Some historians attribute the famine to a stretch of colder climate combined with France’s failure to adopt the potato as the main crop.) Lack of international trade. 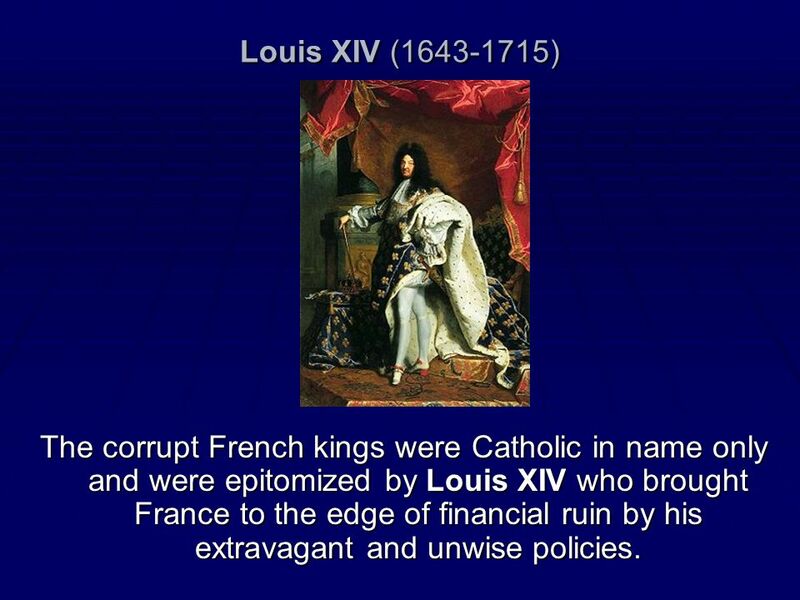 9 Louis XIV ( ) The corrupt French kings were Catholic in name only and were epitomized by Louis XIV who brought France to the edge of financial ruin by his extravagant and unwise policies. 10 Louis XVI ( ) In 1789 King Louis XVI called the French National Assembly into session for the first time in almost 20 years. The Estates General was made up of three groups – clergy, nobility, and commoners. 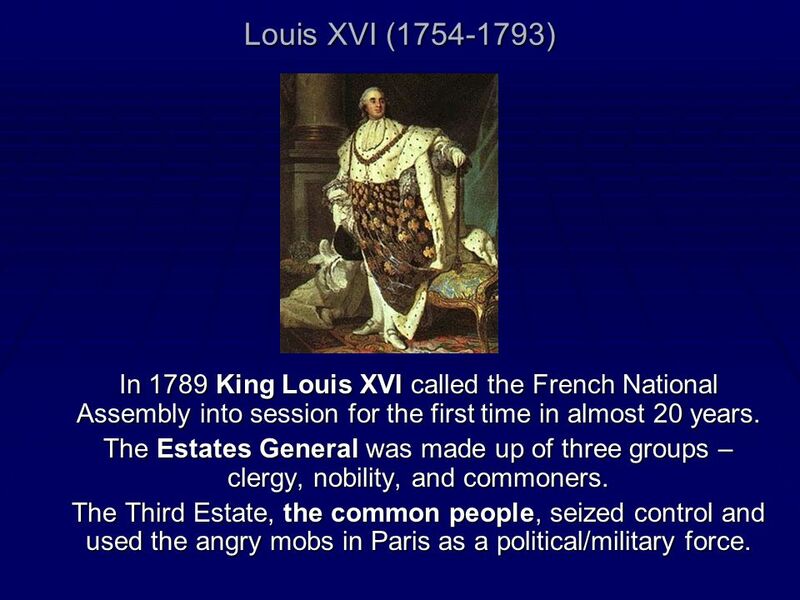 The Third Estate, the common people, seized control and used the angry mobs in Paris as a political/military force. 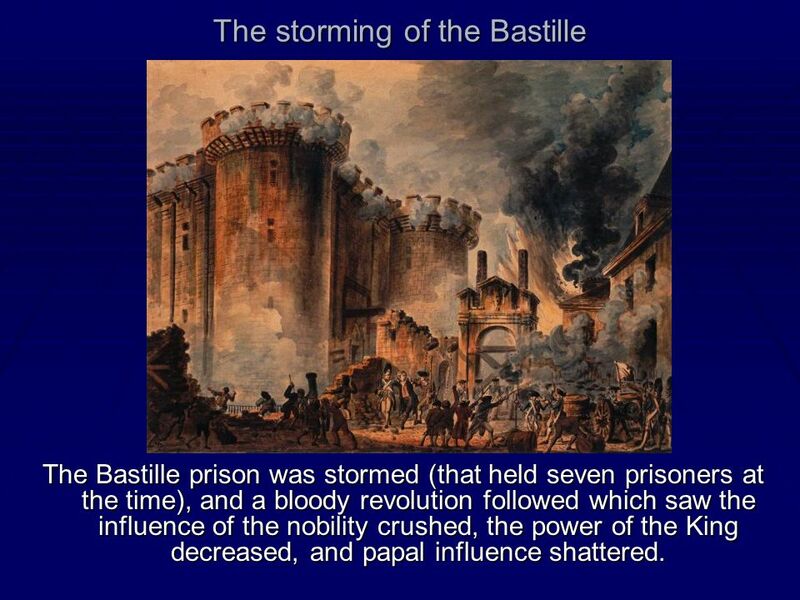 The Bastille prison was stormed (that held seven prisoners at the time), and a bloody revolution followed which saw the influence of the nobility crushed, the power of the King decreased, and papal influence shattered. Was built during the “Hundred Years War”. First used as a fort to defend the east end of Paris. After the war, it was used as a state prison. 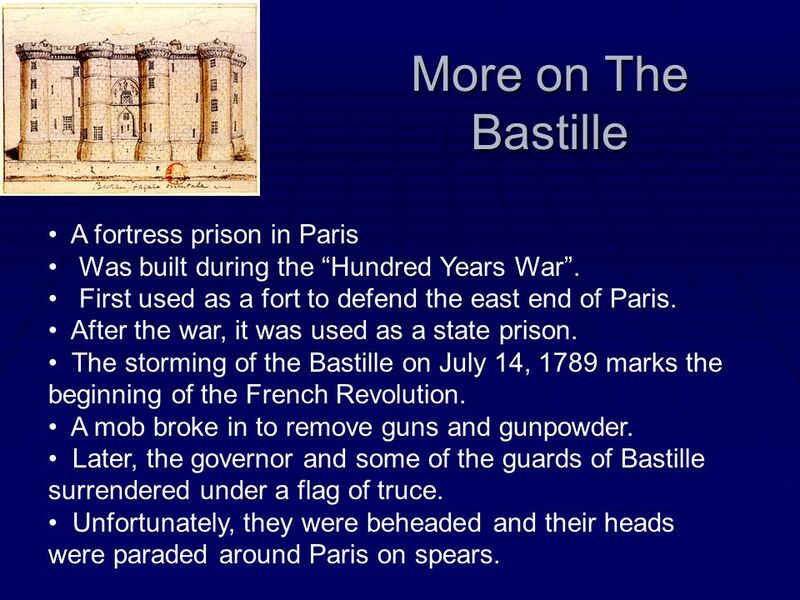 The storming of the Bastille on July 14, 1789 marks the beginning of the French Revolution. A mob broke in to remove guns and gunpowder. Later, the governor and some of the guards of Bastille surrendered under a flag of truce. Unfortunately, they were beheaded and their heads were paraded around Paris on spears. 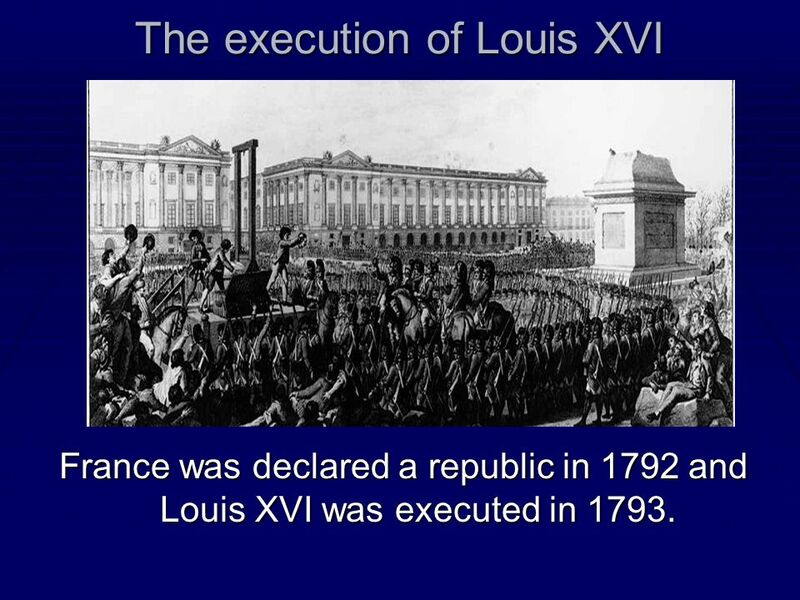 France was declared a republic in 1792 and Louis XVI was executed in 1793. 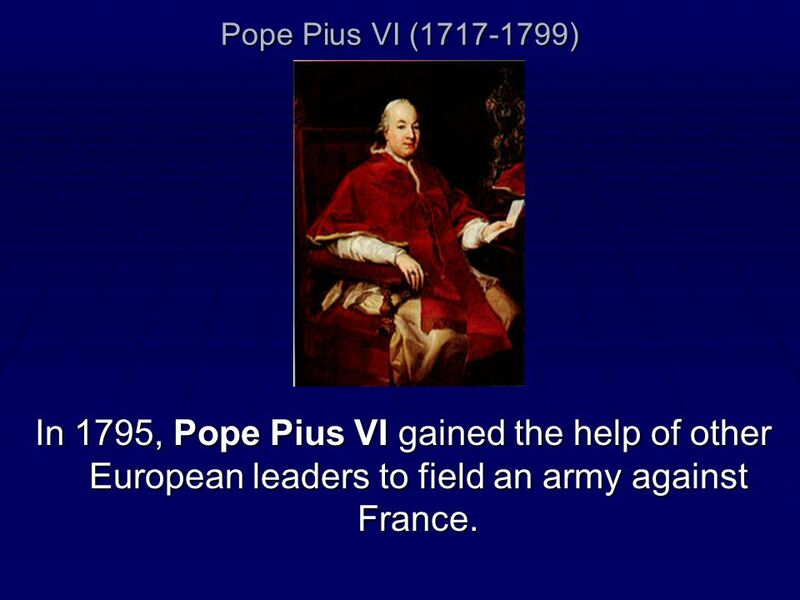 14 Pope Pius VI ( ) In 1795, Pope Pius VI gained the help of other European leaders to field an army against France. 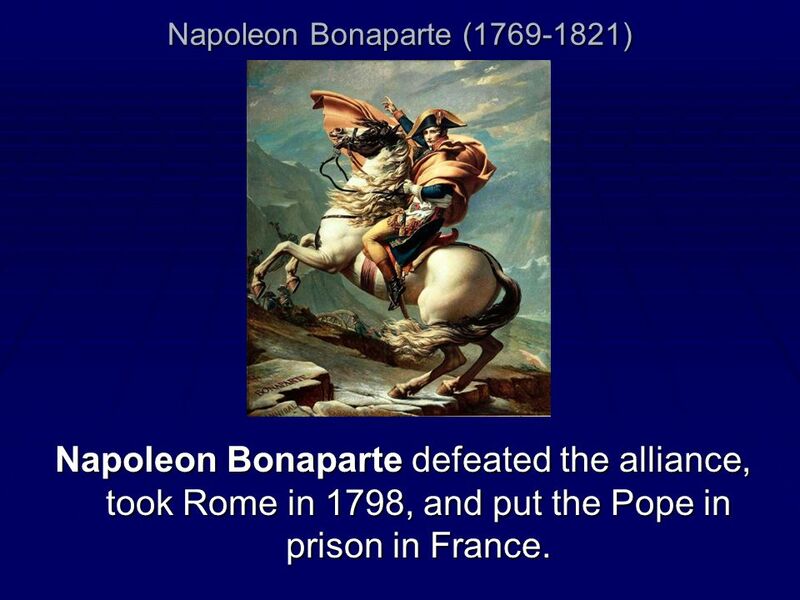 Napoleon Bonaparte defeated the alliance, took Rome in 1798, and put the Pope in prison in France. 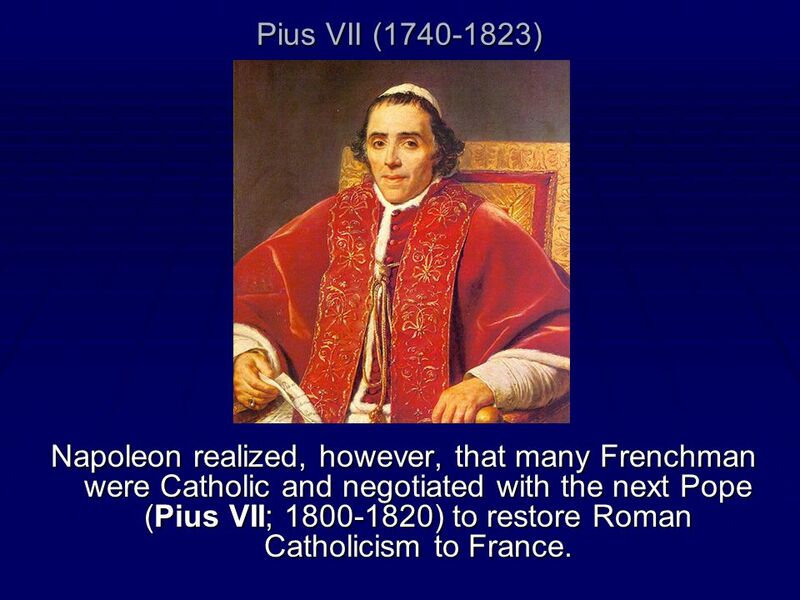 16 Pius VII ( ) Napoleon realized, however, that many Frenchman were Catholic and negotiated with the next Pope (Pius VII; ) to restore Roman Catholicism to France. 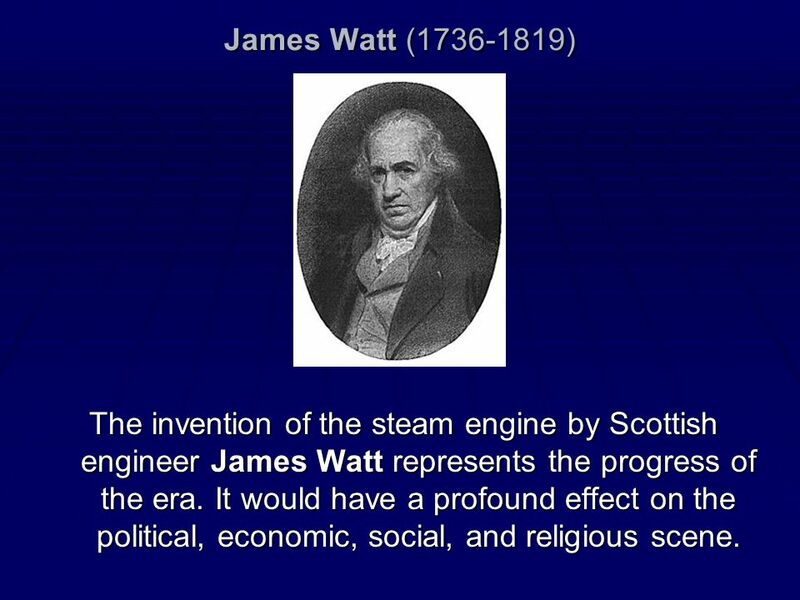 19 James Watt ( ) The invention of the steam engine by Scottish engineer James Watt represents the progress of the era. It would have a profound effect on the political, economic, social, and religious scene. 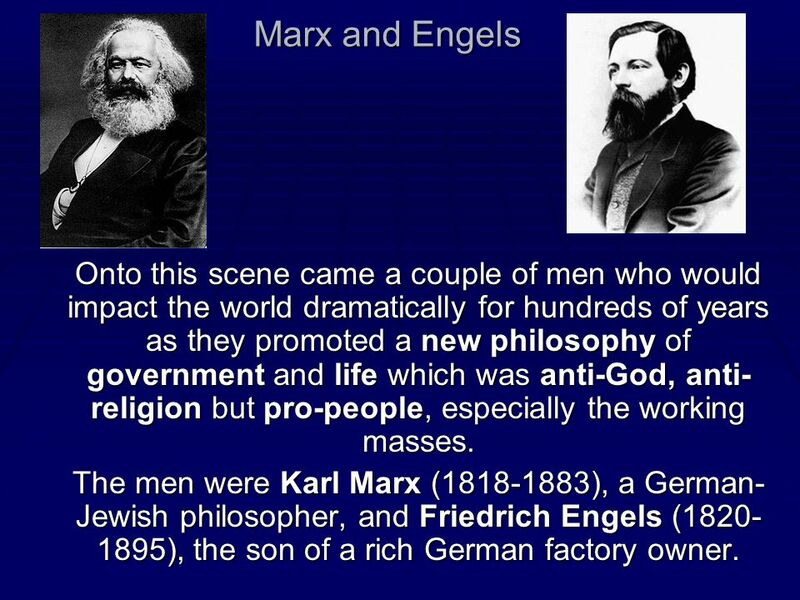 21 Marx and Engels Onto this scene came a couple of men who would impact the world dramatically for hundreds of years as they promoted a new philosophy of government and life which was anti-God, anti-religion but pro-people, especially the working masses. 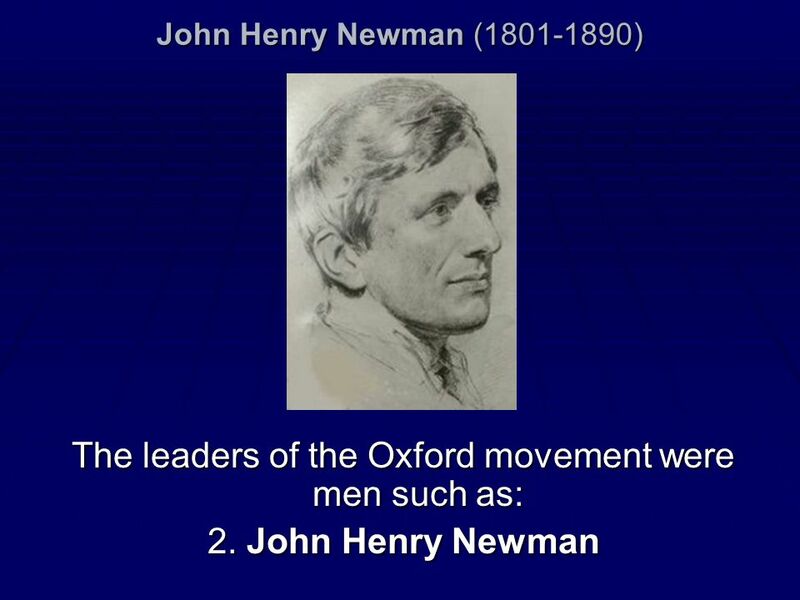 The men were Karl Marx ( ), a German-Jewish philosopher, and Friedrich Engels ( ), the son of a rich German factory owner. 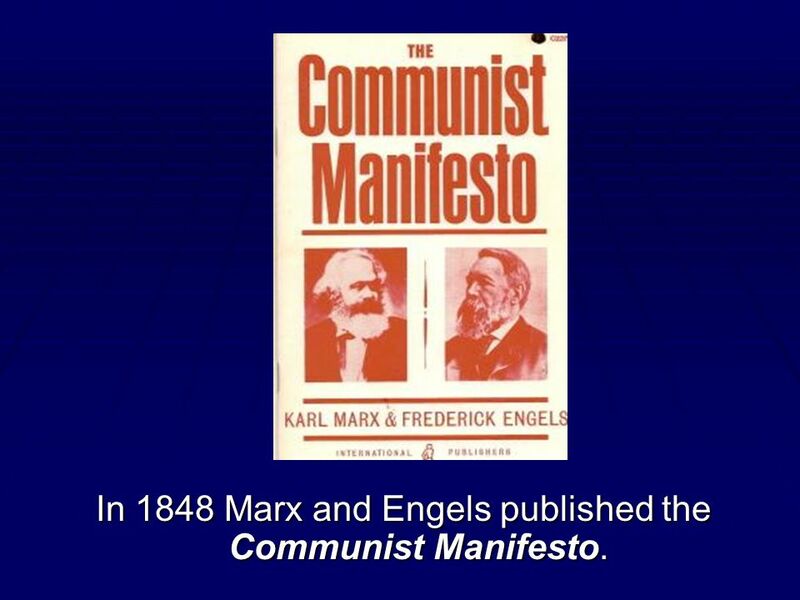 22 In 1848 Marx and Engels published the Communist Manifesto. 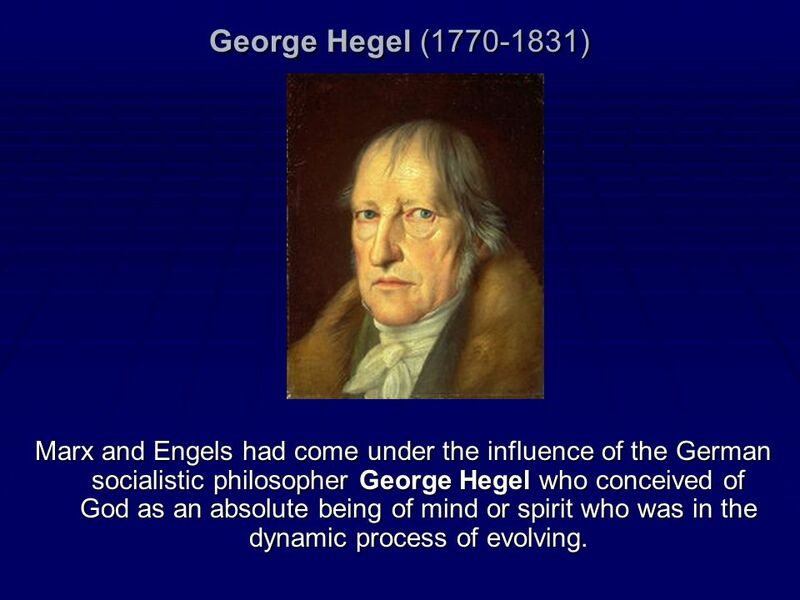 23 George Hegel ( ) Marx and Engels had come under the influence of the German socialistic philosopher George Hegel who conceived of God as an absolute being of mind or spirit who was in the dynamic process of evolving. 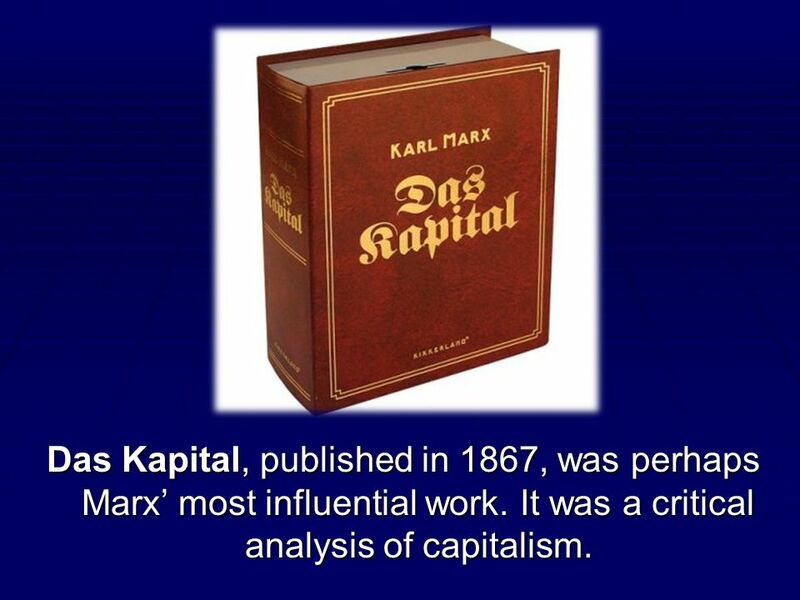 24 Das Kapital, published in 1867, was perhaps Marx’ most influential work. It was a critical analysis of capitalism. 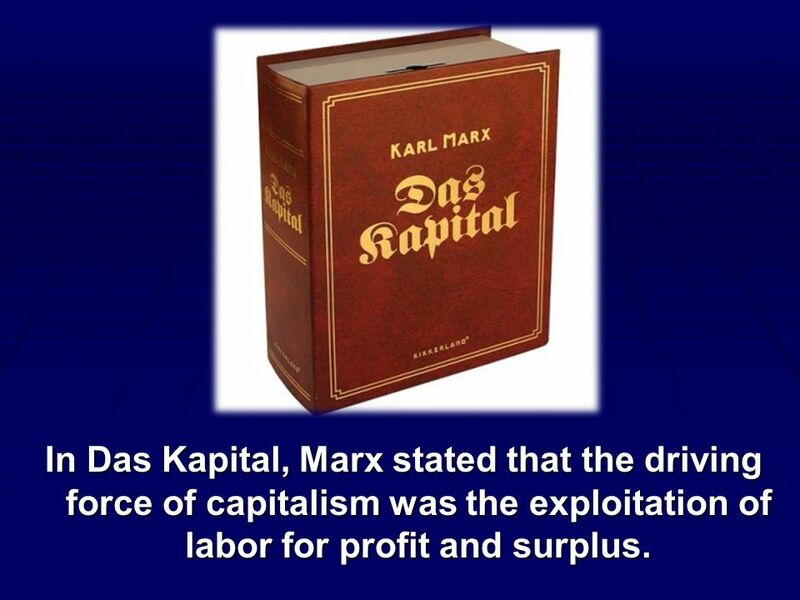 25 In Das Kapital, Marx stated that the driving force of capitalism was the exploitation of labor for profit and surplus. 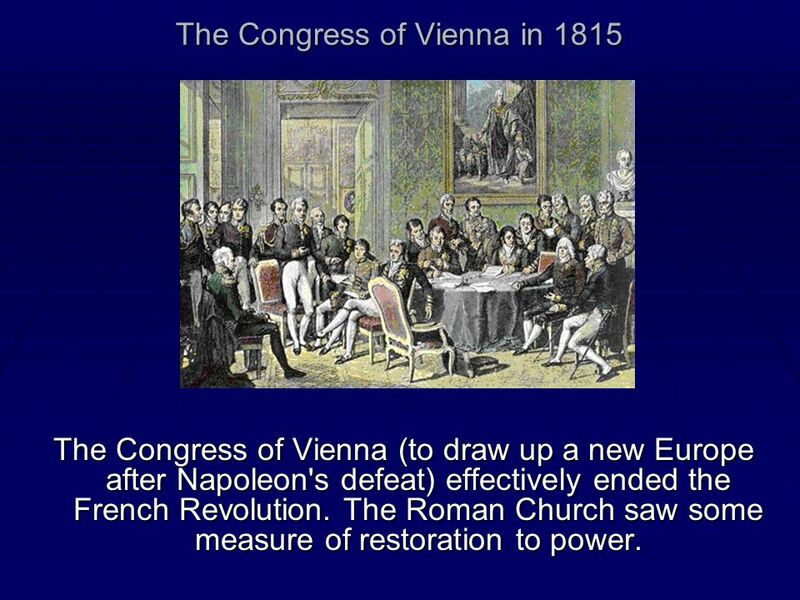 The Congress of Vienna (to draw up a new Europe after Napoleon's defeat) effectively ended the French Revolution. The Roman Church saw some measure of restoration to power. 27 Pope Pius IX ( ) Pope Pius IX led the way to establishing the ultimate authority of the Pope in the Roman Church through a series of declarations of doctrinal dogma for Catholics: in 1854, the Immaculate Conception of Mary was declared (that she was conceived sinless) which had to be believed for salvation. 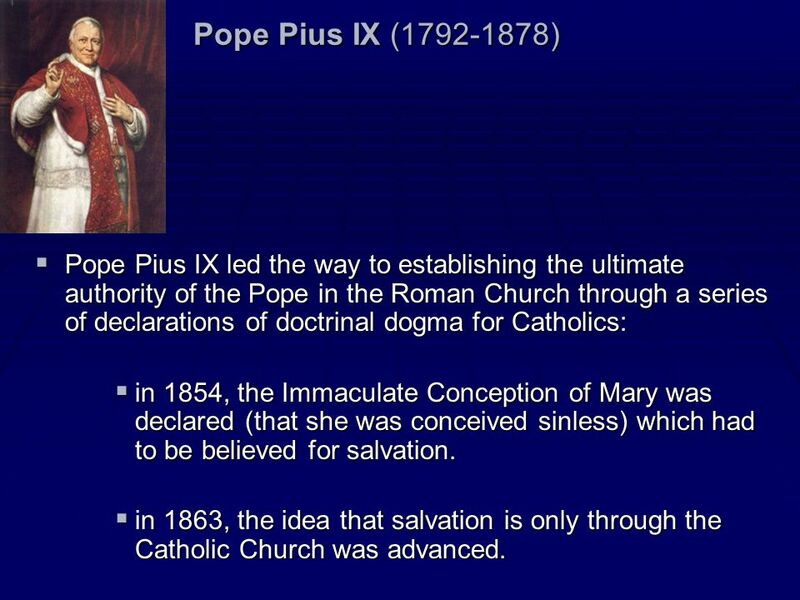 in 1863, the idea that salvation is only through the Catholic Church was advanced. 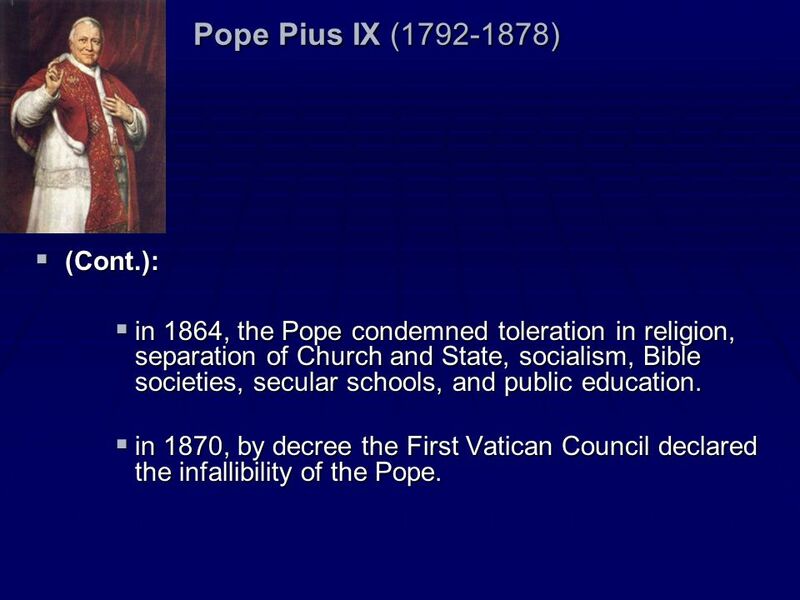 in 1864, the Pope condemned toleration in religion, separation of Church and State, socialism, Bible societies, secular schools, and public education. in 1870, by decree the First Vatican Council declared the infallibility of the Pope. Public and political sentiment ran strongly against the Popes from 1870 forward. 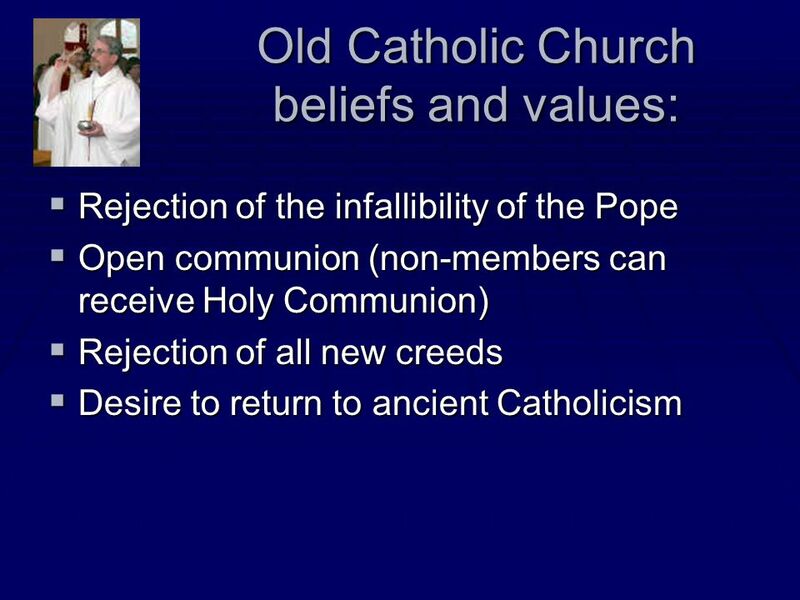 Even among Catholics the doctrine of papal infallibility was not accepted by all. 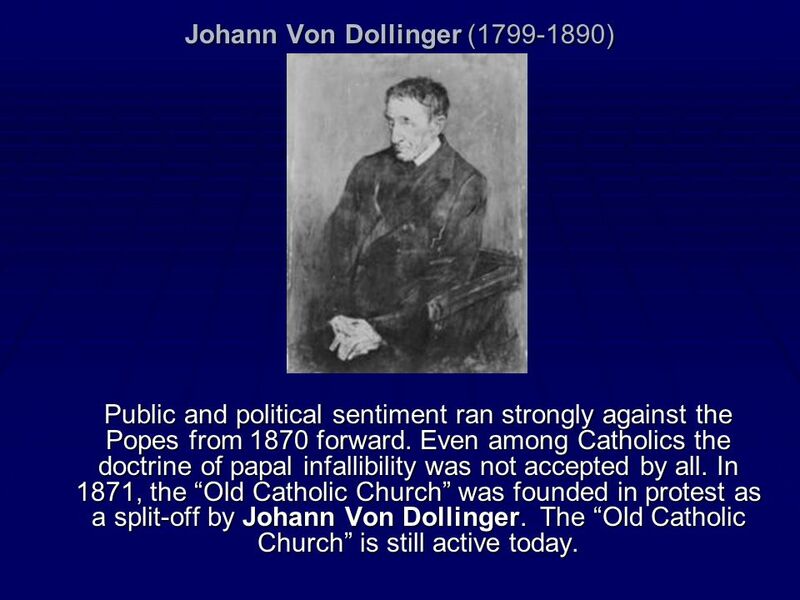 In 1871, the “Old Catholic Church” was founded in protest as a split-off by Johann Von Dollinger. The “Old Catholic Church” is still active today. 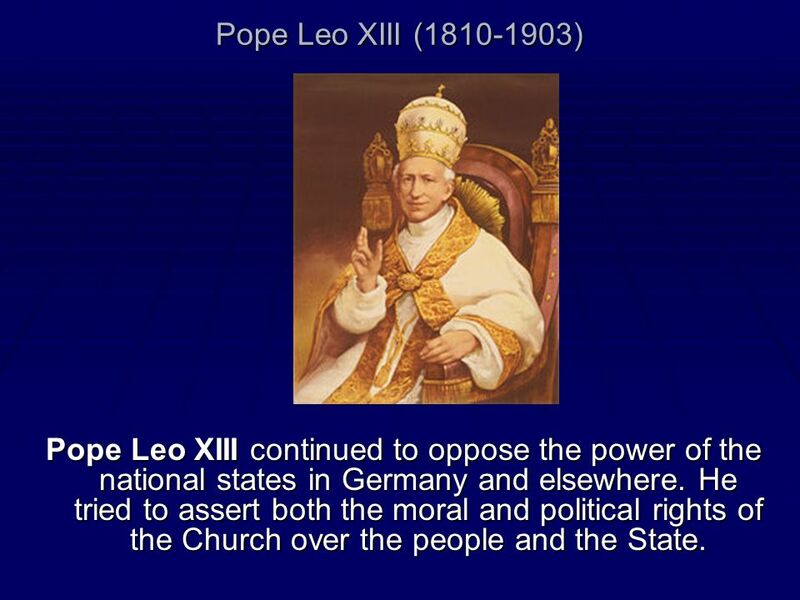 31 Pope Leo XIII ( ) Pope Leo XIII continued to oppose the power of the national states in Germany and elsewhere. 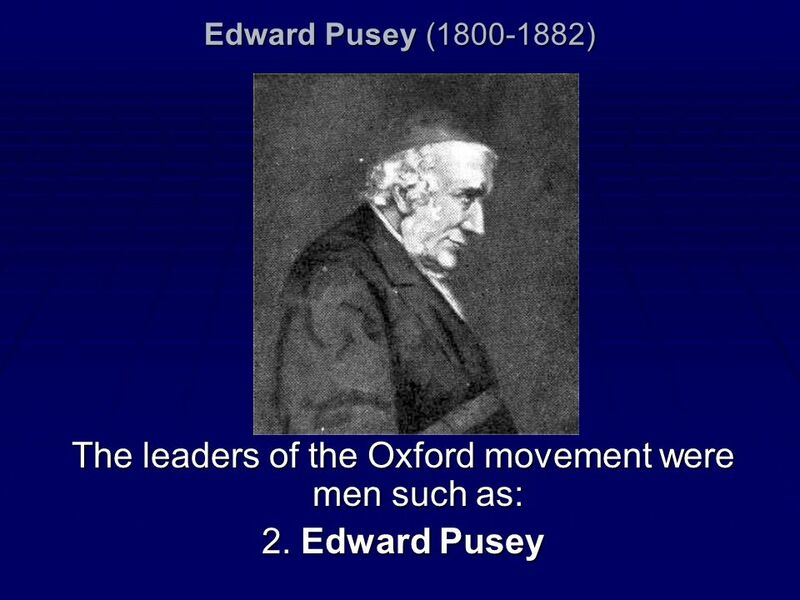 He tried to assert both the moral and political rights of the Church over the people and the State. 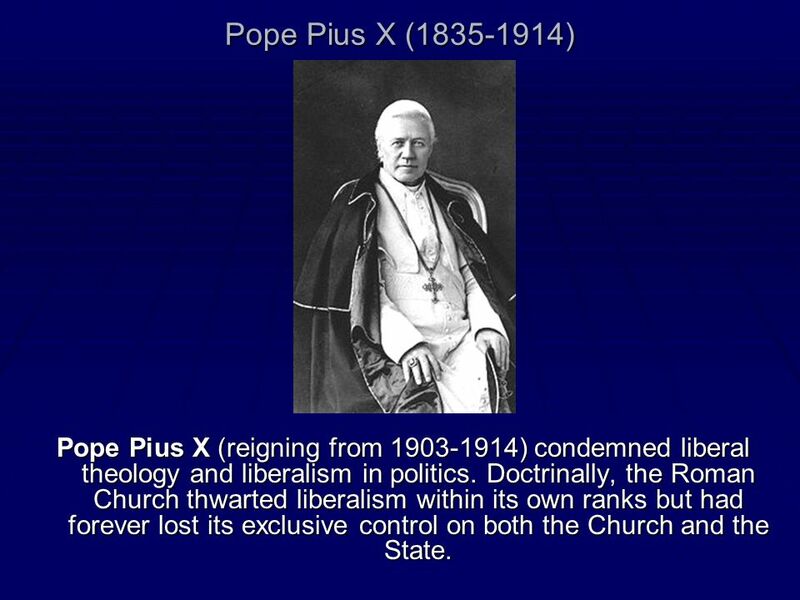 32 Pope Pius X ( ) Pope Pius X (reigning from ) condemned liberal theology and liberalism in politics. Doctrinally, the Roman Church thwarted liberalism within its own ranks but had forever lost its exclusive control on both the Church and the State. 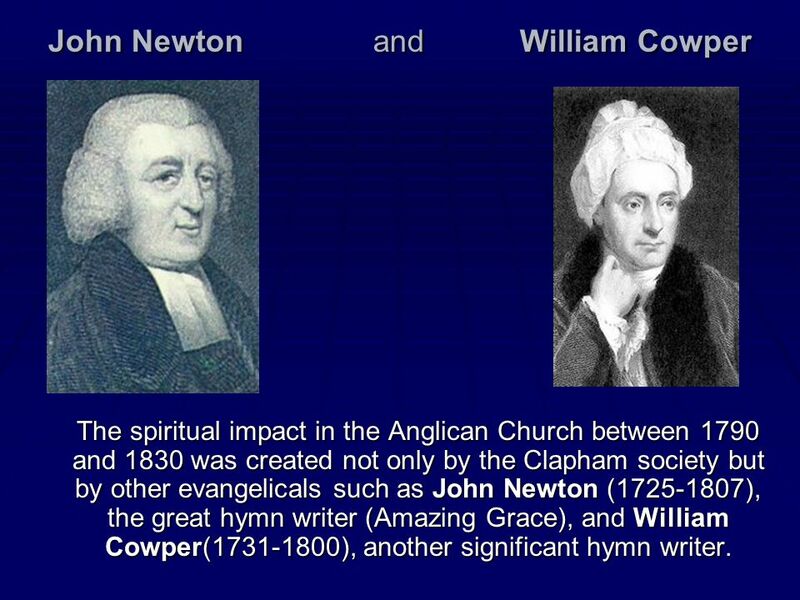 The spiritual impact in the Anglican Church between 1790 and 1830 was created not only by the Clapham society but by other evangelicals such as John Newton ( ), the great hymn writer (Amazing Grace), and William Cowper( ), another significant hymn writer. 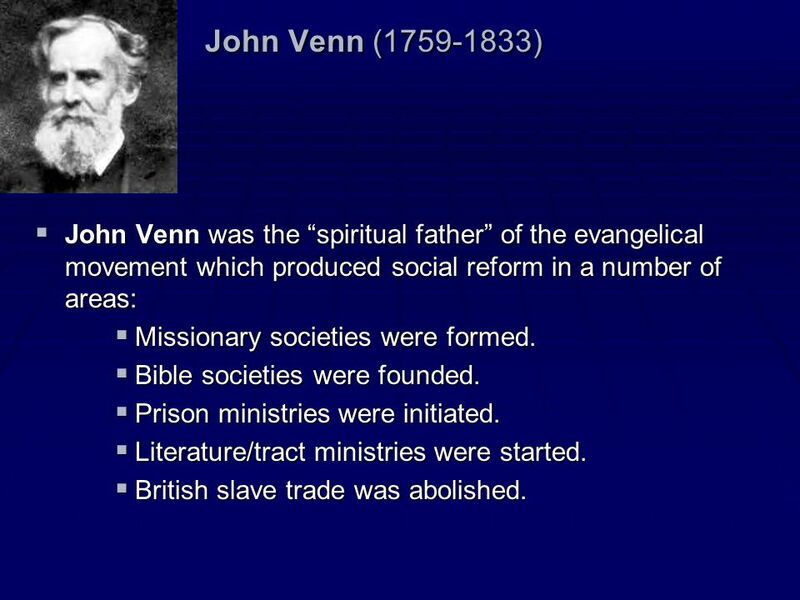 34 John Venn ( ) John Venn was the “spiritual father” of the evangelical movement which produced social reform in a number of areas: Missionary societies were formed. Bible societies were founded. Prison ministries were initiated. Literature/tract ministries were started. British slave trade was abolished. Perhaps this last contribution was the most important. 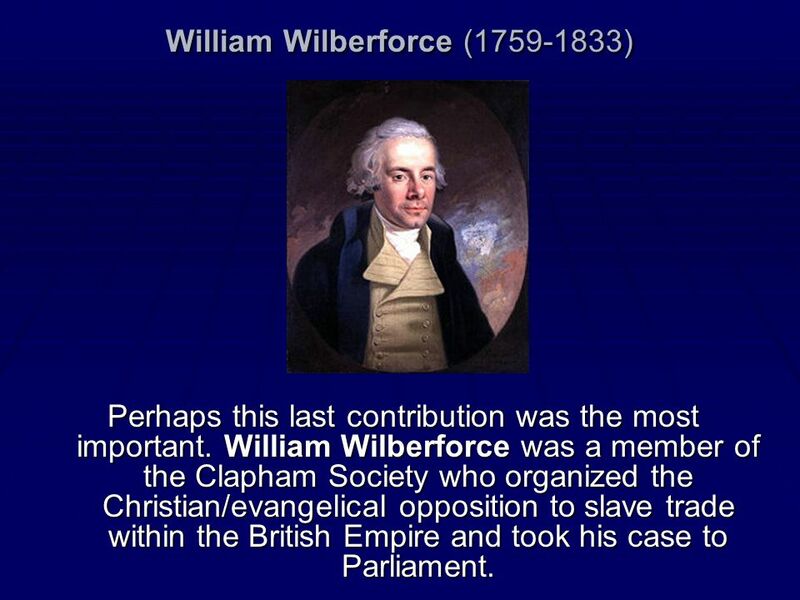 William Wilberforce was a member of the Clapham Society who organized the Christian/evangelical opposition to slave trade within the British Empire and took his case to Parliament. 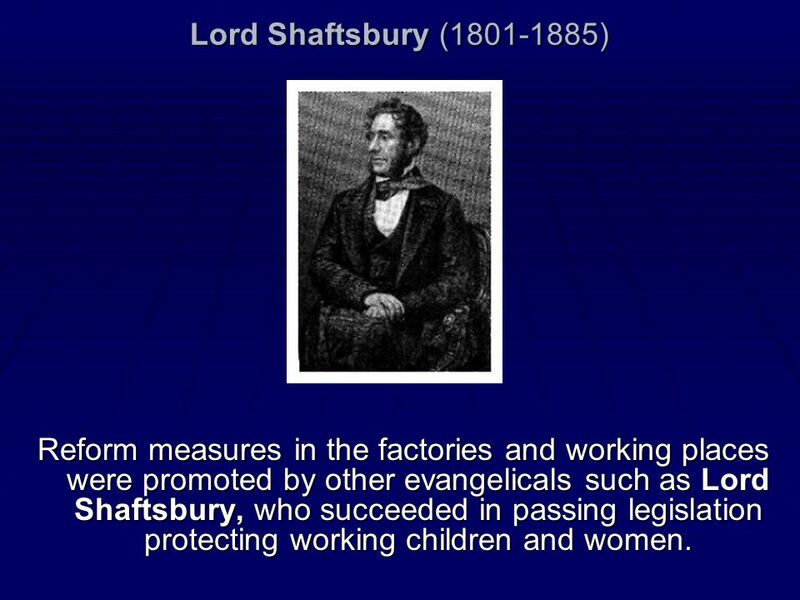 36 Lord Shaftsbury ( ) Reform measures in the factories and working places were promoted by other evangelicals such as Lord Shaftsbury, who succeeded in passing legislation protecting working children and women. 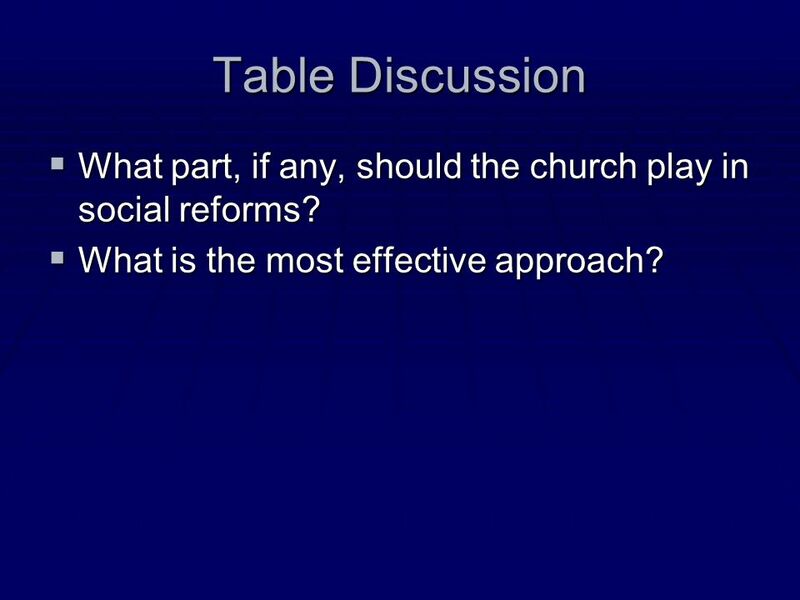 37 Table Discussion What part, if any, should the church play in social reforms? What is the most effective approach? 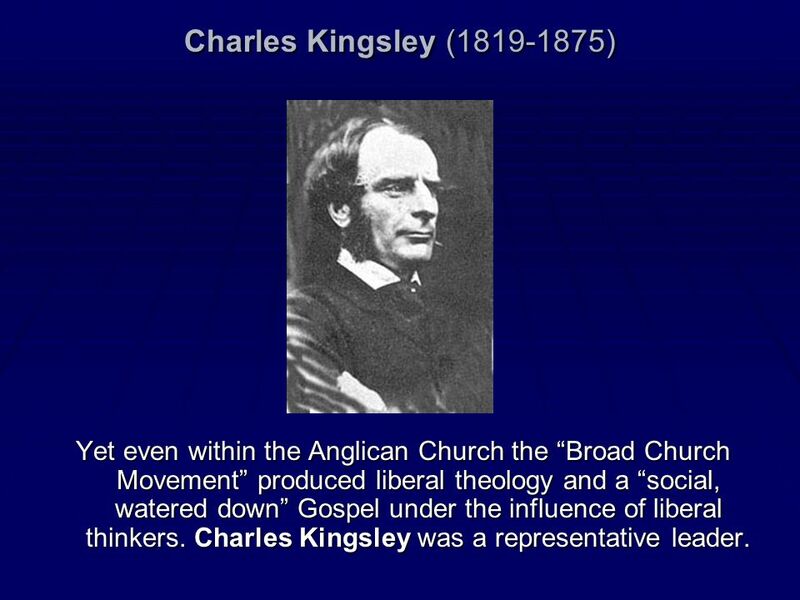 38 Charles Kingsley ( ) Yet even within the Anglican Church the “Broad Church Movement” produced liberal theology and a “social, watered down” Gospel under the influence of liberal thinkers. Charles Kingsley was a representative leader. 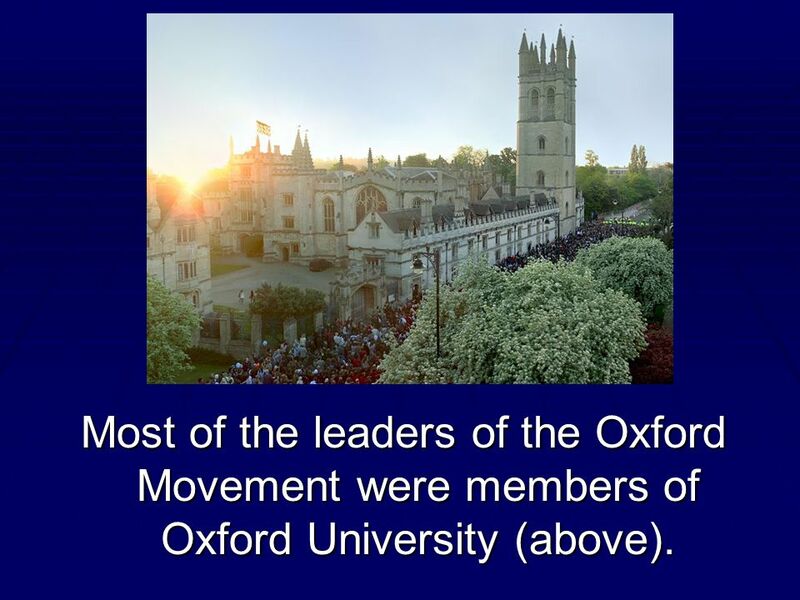 39 Most of the leaders of the Oxford Movement were members of Oxford University (above). 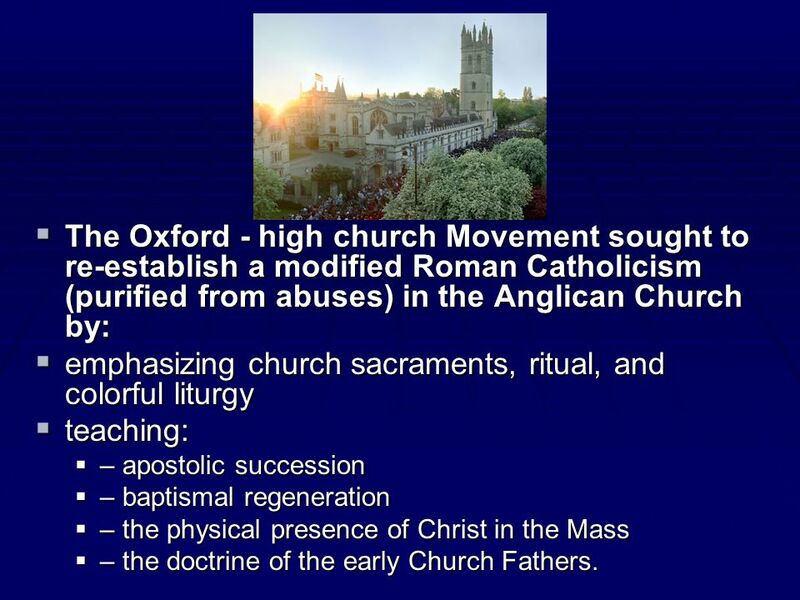 The Oxford - high church Movement sought to re-establish a modified Roman Catholicism (purified from abuses) in the Anglican Church by: emphasizing church sacraments, ritual, and colorful liturgy teaching: – apostolic succession – baptismal regeneration – the physical presence of Christ in the Mass – the doctrine of the early Church Fathers. 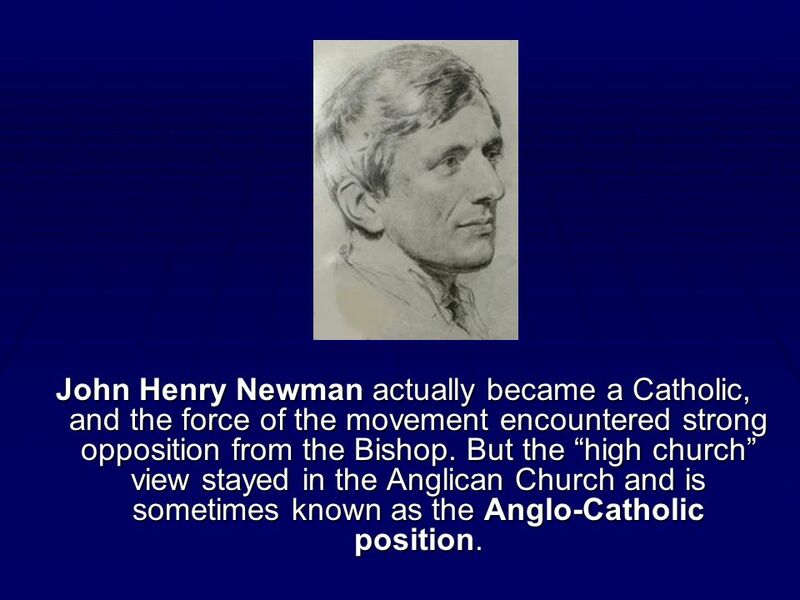 44 John Henry Newman actually became a Catholic, and the force of the movement encountered strong opposition from the Bishop. But the “high church” view stayed in the Anglican Church and is sometimes known as the Anglo-Catholic position. 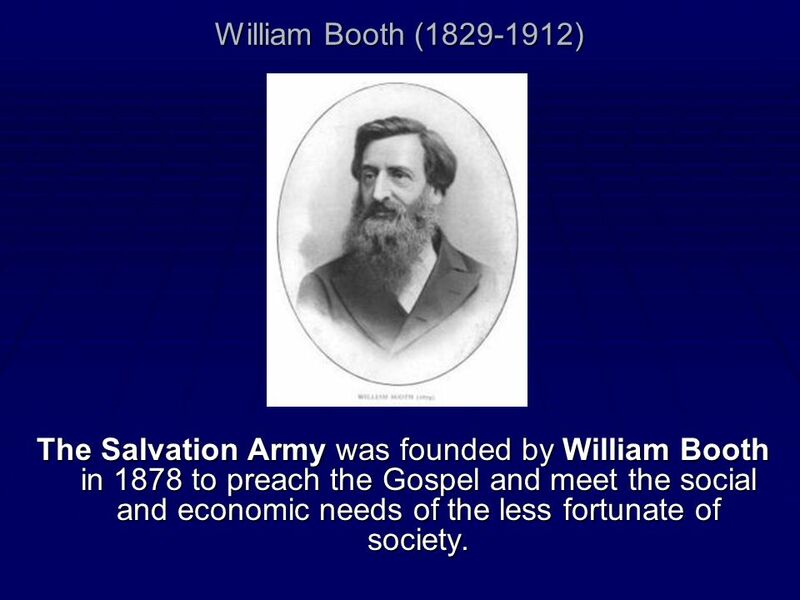 45 William Booth ( ) The Salvation Army was founded by William Booth in 1878 to preach the Gospel and meet the social and economic needs of the less fortunate of society. 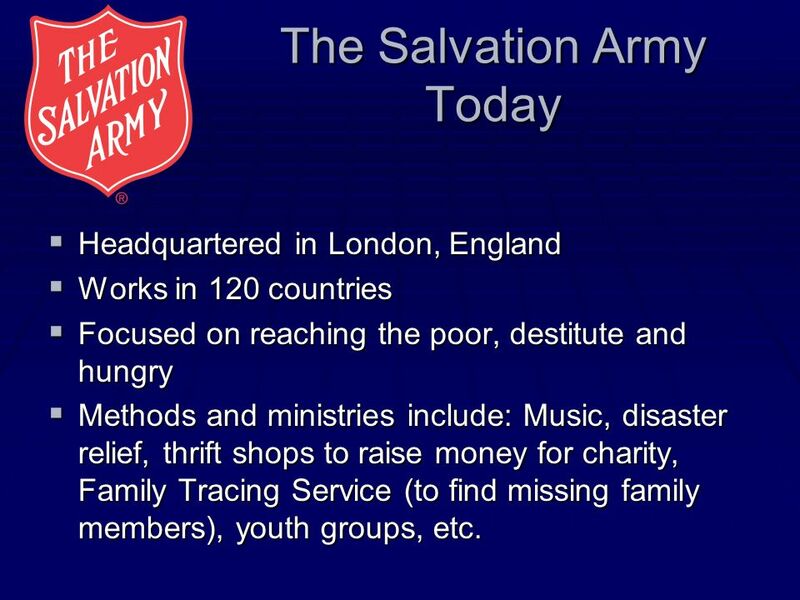 Headquartered in London, England Works in 120 countries Focused on reaching the poor, destitute and hungry Methods and ministries include: Music, disaster relief, thrift shops to raise money for charity, Family Tracing Service (to find missing family members), youth groups, etc. 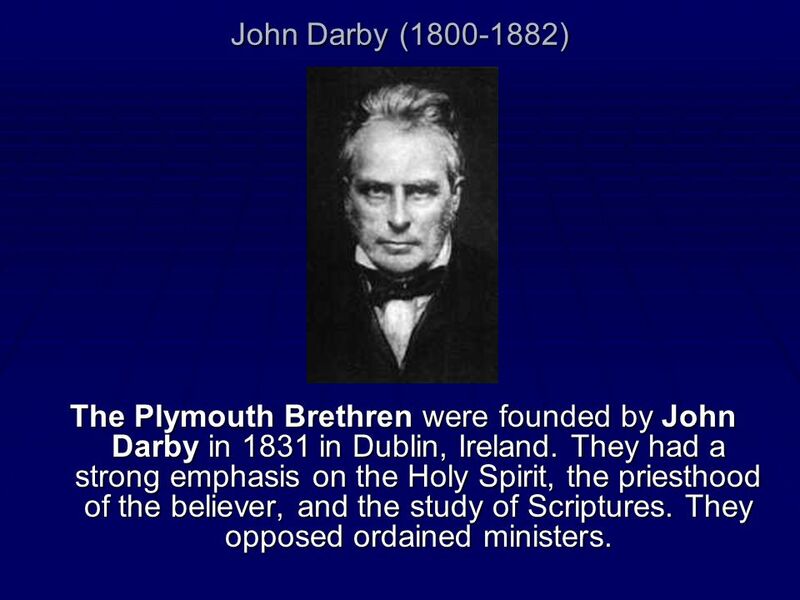 47 John Darby ( ) The Plymouth Brethren were founded by John Darby in 1831 in Dublin, Ireland. They had a strong emphasis on the Holy Spirit, the priesthood of the believer, and the study of Scriptures. They opposed ordained ministers. 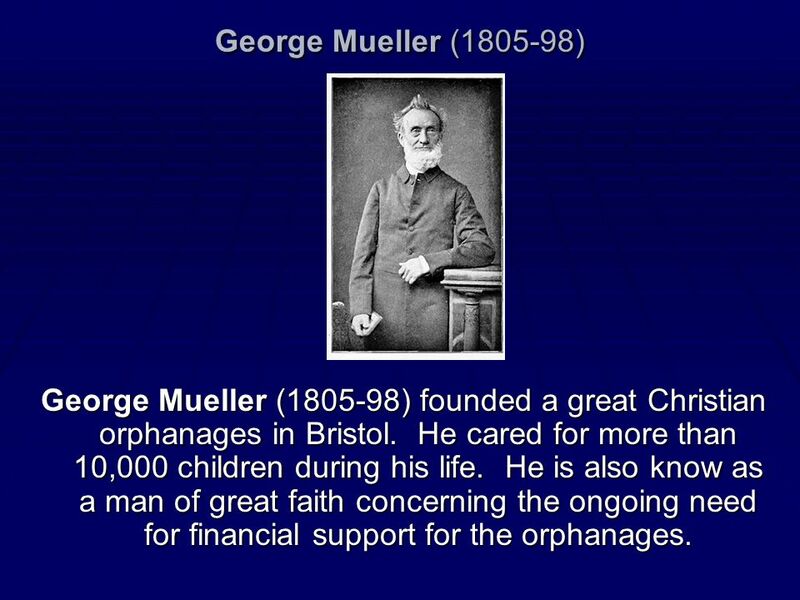 48 George Mueller ( ) George Mueller ( ) founded a great Christian orphanages in Bristol. He cared for more than 10,000 children during his life. He is also know as a man of great faith concerning the ongoing need for financial support for the orphanages. 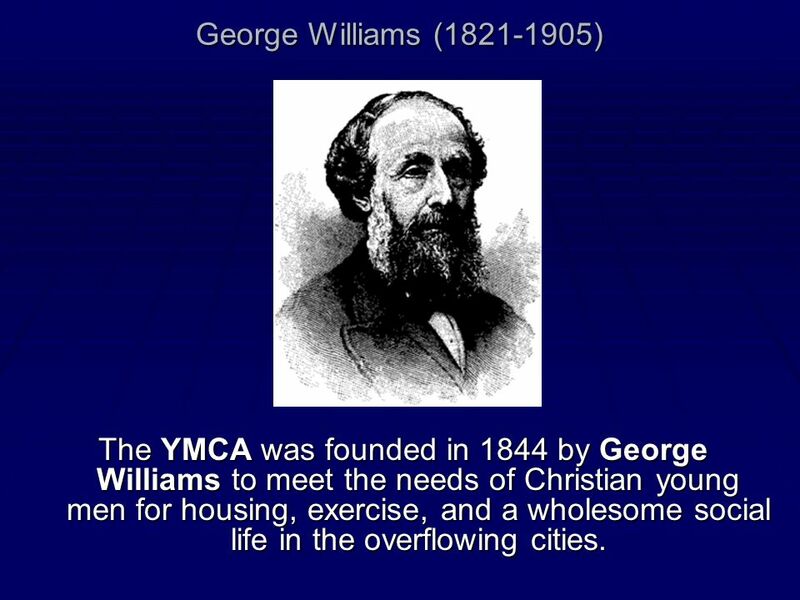 49 George Williams ( ) The YMCA was founded in 1844 by George Williams to meet the needs of Christian young men for housing, exercise, and a wholesome social life in the overflowing cities. 50 Charles H. Spurgeon ( ) Charles H. Spurgeon preached the Gospel powerfully in London’s Metropolitan Tabernacle and founded a pastor’s college. 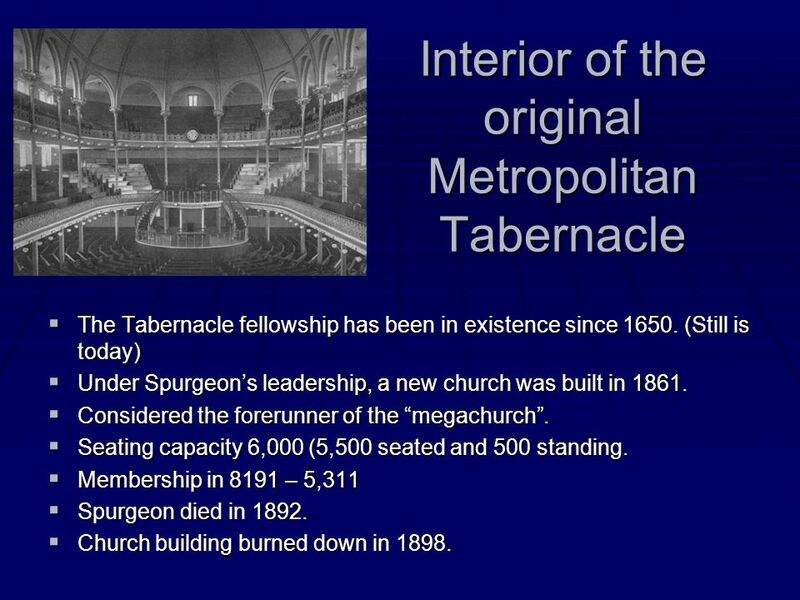 The Tabernacle fellowship has been in existence since (Still is today) Under Spurgeon’s leadership, a new church was built in 1861. Considered the forerunner of the “megachurch”. Seating capacity 6,000 (5,500 seated and 500 standing. 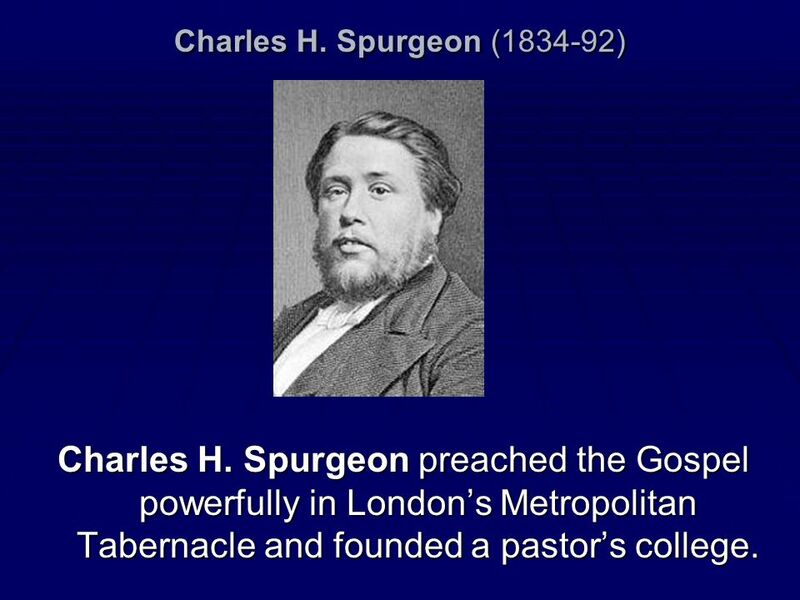 Membership in 8191 – 5,311 Spurgeon died in 1892. Church building burned down in 1898. 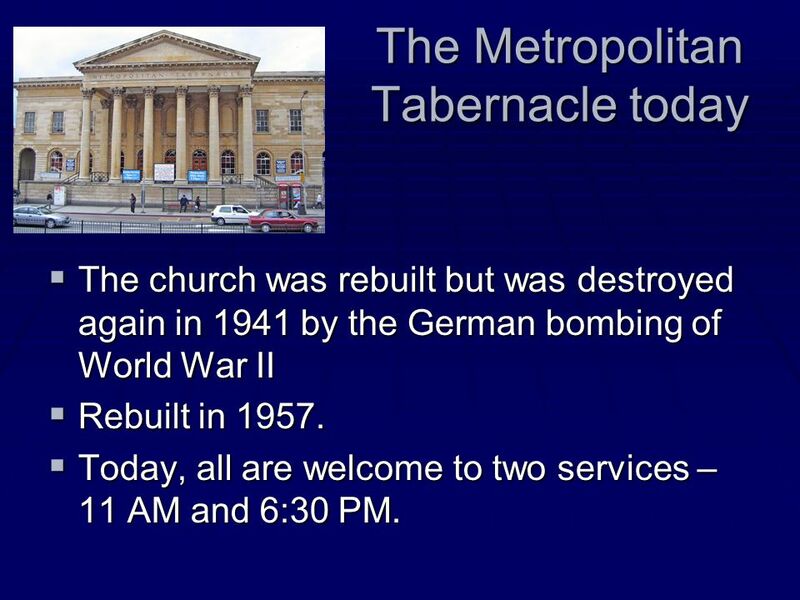 The church was rebuilt but was destroyed again in 1941 by the German bombing of World War II Rebuilt in 1957. Today, all are welcome to two services – 11 AM and 6:30 PM. 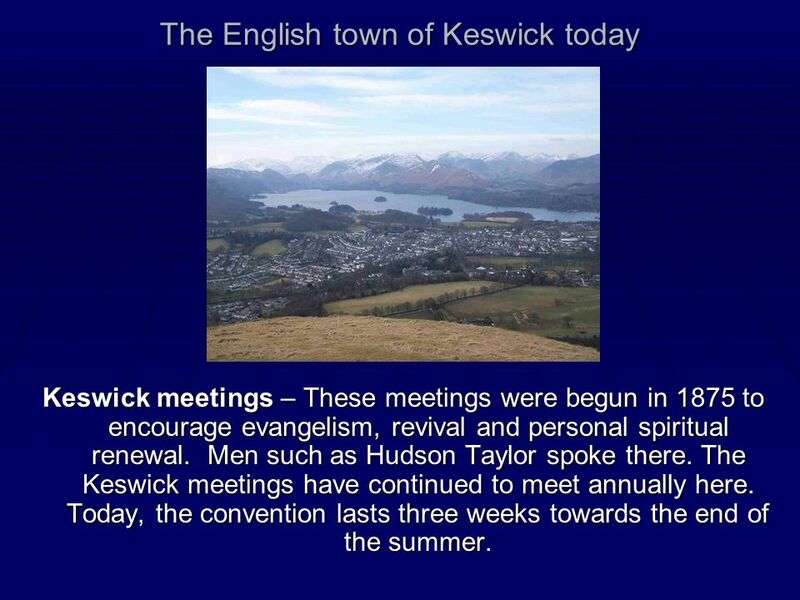 Keswick meetings – These meetings were begun in 1875 to encourage evangelism, revival and personal spiritual renewal. 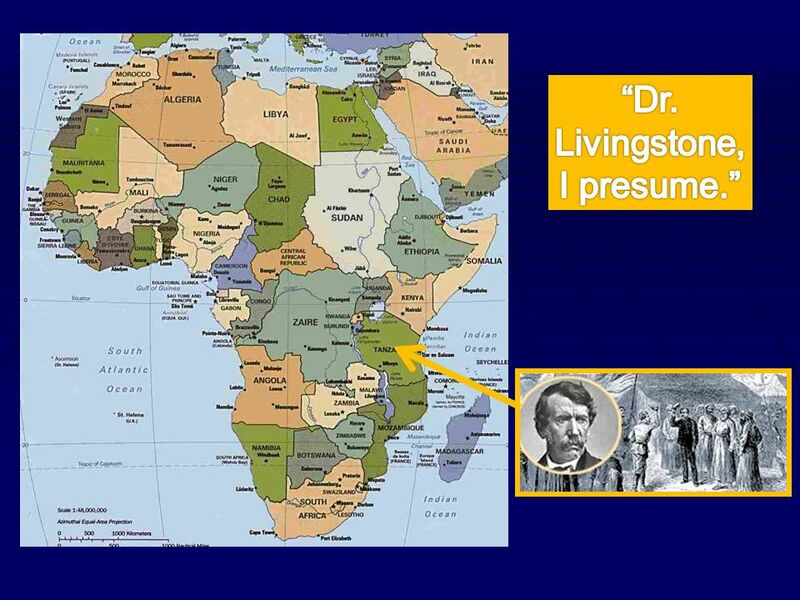 Men such as Hudson Taylor spoke there. The Keswick meetings have continued to meet annually here. Today, the convention lasts three weeks towards the end of the summer. 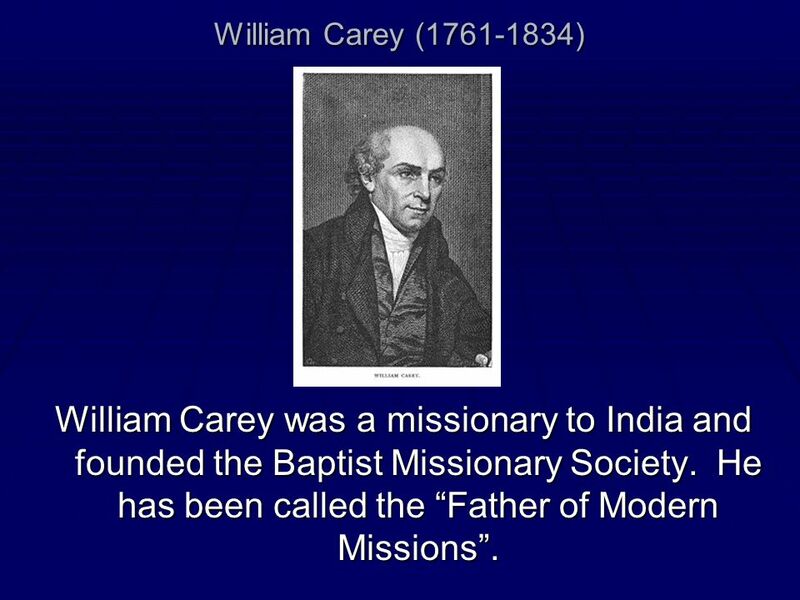 54 William Carey ( ) William Carey was a missionary to India and founded the Baptist Missionary Society. 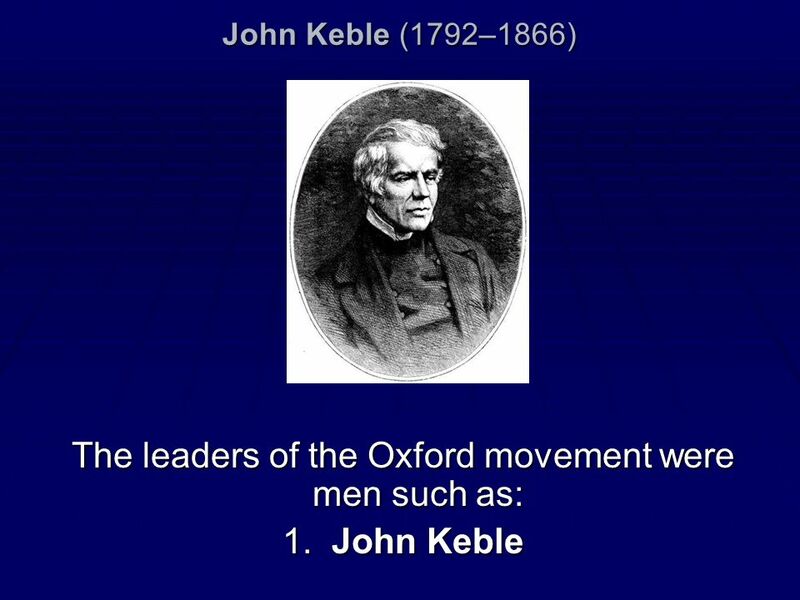 He has been called the “Father of Modern Missions”. 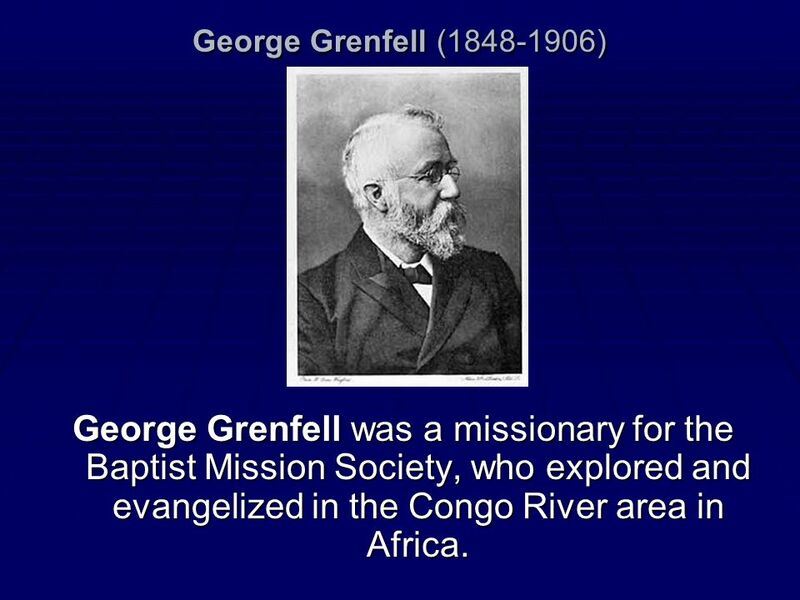 55 George Grenfell ( ) George Grenfell was a missionary for the Baptist Mission Society, who explored and evangelized in the Congo River area in Africa. 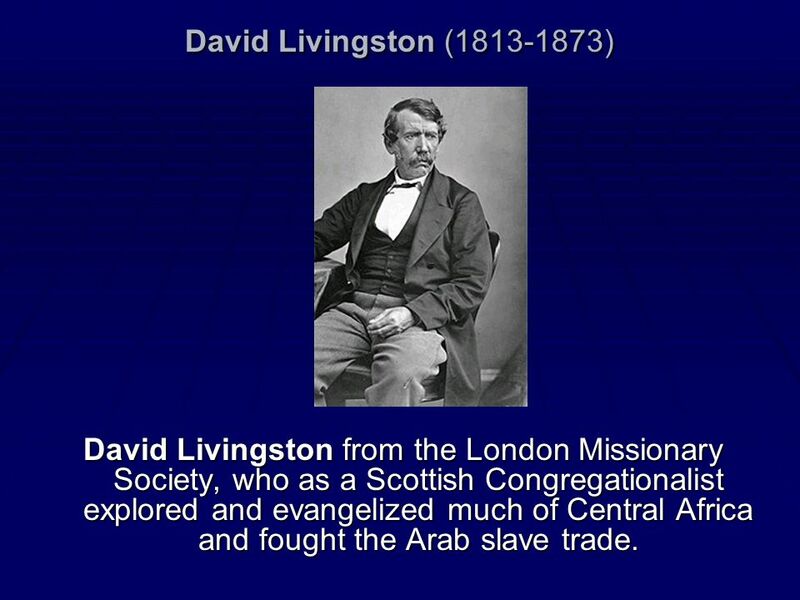 56 David Livingston ( ) David Livingston from the London Missionary Society, who as a Scottish Congregationalist explored and evangelized much of Central Africa and fought the Arab slave trade. 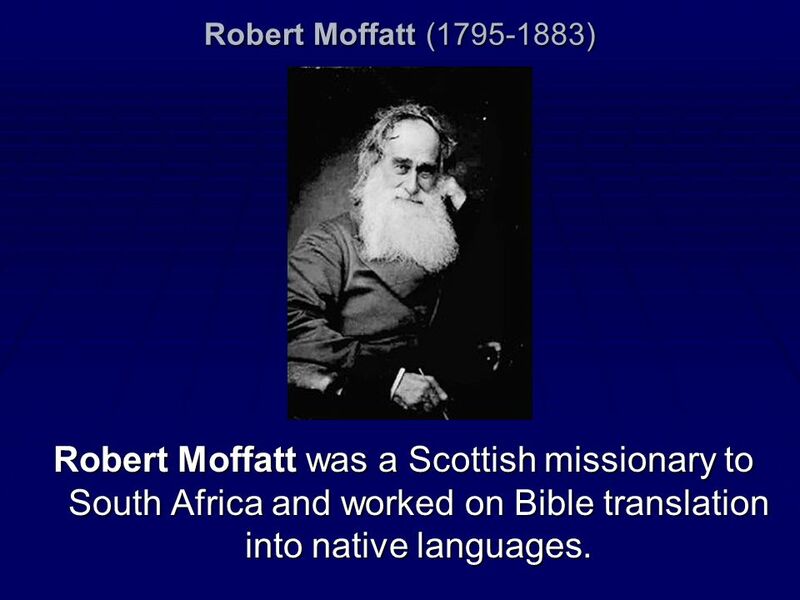 58 Robert Moffatt ( ) Robert Moffatt was a Scottish missionary to South Africa and worked on Bible translation into native languages. 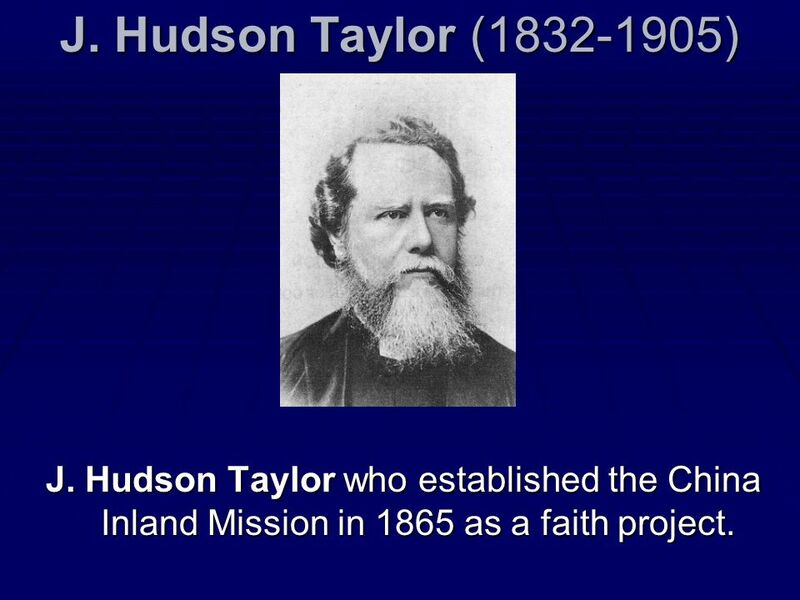 59 J. Hudson Taylor ( ) J. Hudson Taylor who established the China Inland Mission in 1865 as a faith project. 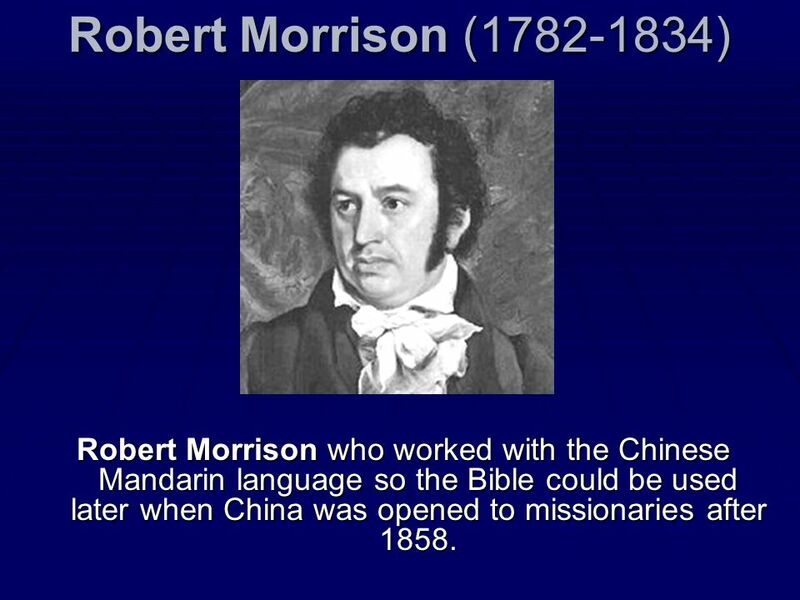 60 Robert Morrison ( ) Robert Morrison who worked with the Chinese Mandarin language so the Bible could be used later when China was opened to missionaries after 1858. 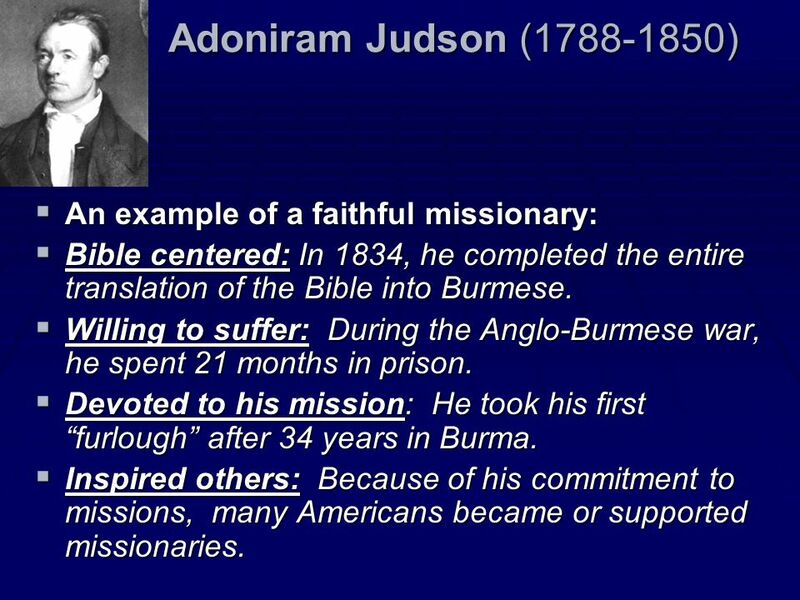 Adoniram Judson who worked with Burmese language translation. 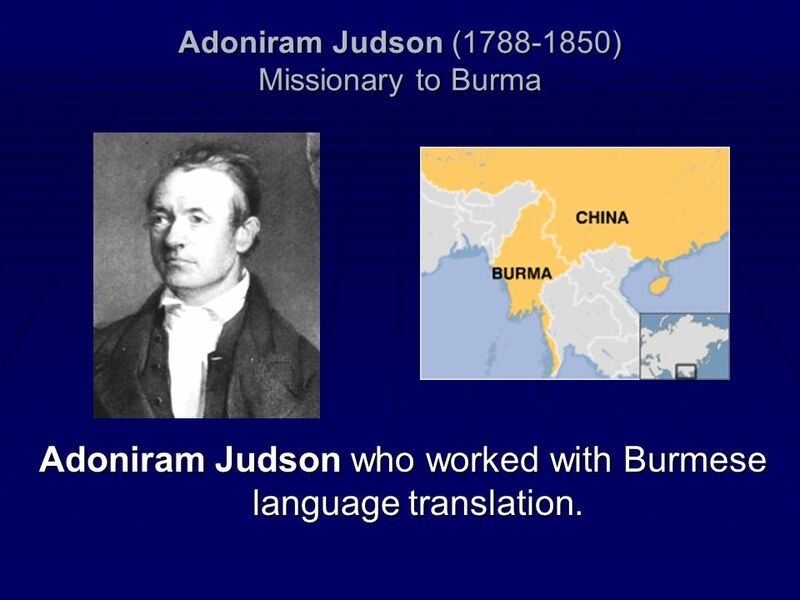 Bible centered: In 1834, he completed the entire translation of the Bible into Burmese. Willing to suffer: During the Anglo-Burmese war, he spent 21 months in prison. Devoted to his mission: He took his first “furlough” after 34 years in Burma. Inspired others: Because of his commitment to missions, many Americans became or supported missionaries. 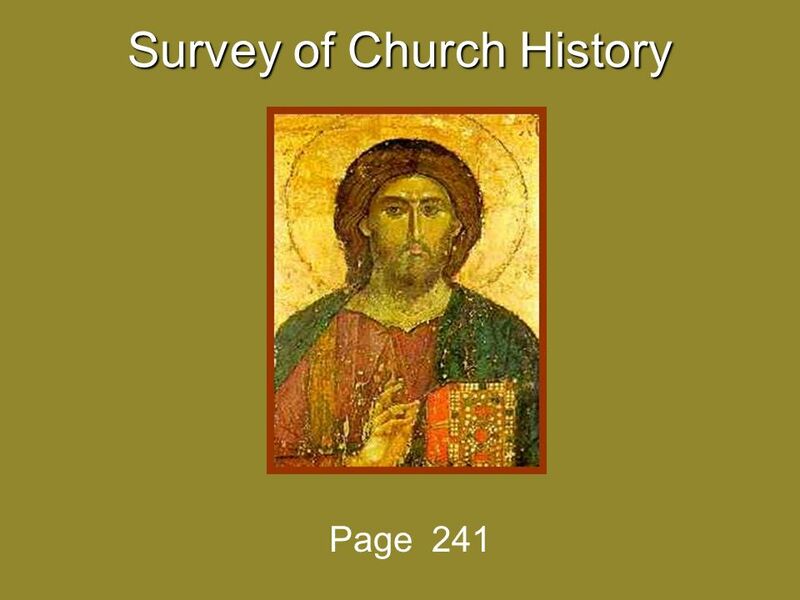 Download ppt "Survey of Church History"
World History B SSWH15 The student will be able to describe the impact of industrialization, the rise of nationalism, and the major characteristics of. 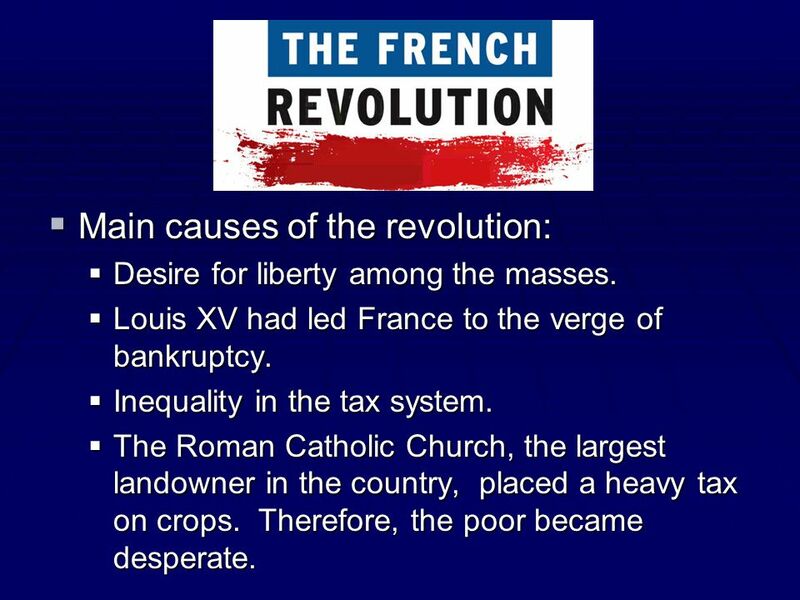 French Revolution ( ) I.Intro II.Background/Why a Revolution? A.Economy/Monarchy B.Estates General III.Freedom/Equality ( ) A.Taking Action. 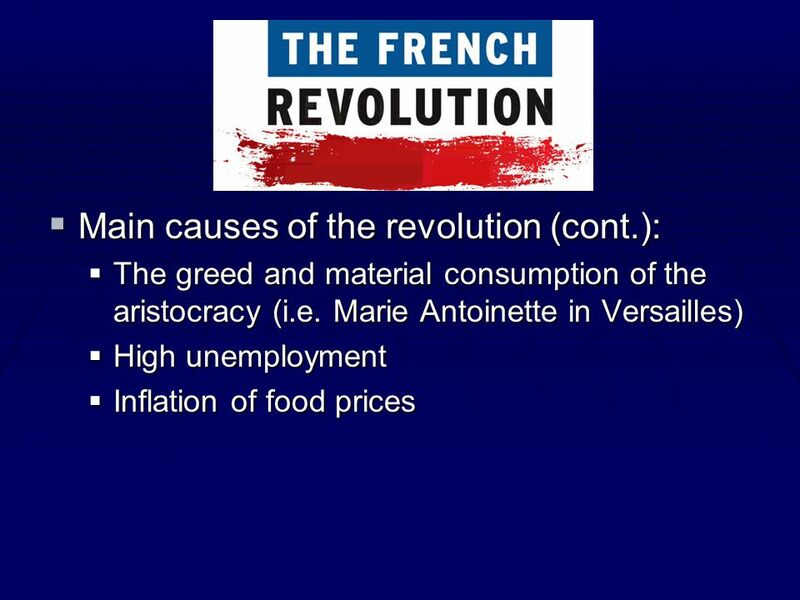 World Cultures Chapter 18: The French Revolution. T HE F RENCH R EVOLUTION & N APOLEON Chapter 18. 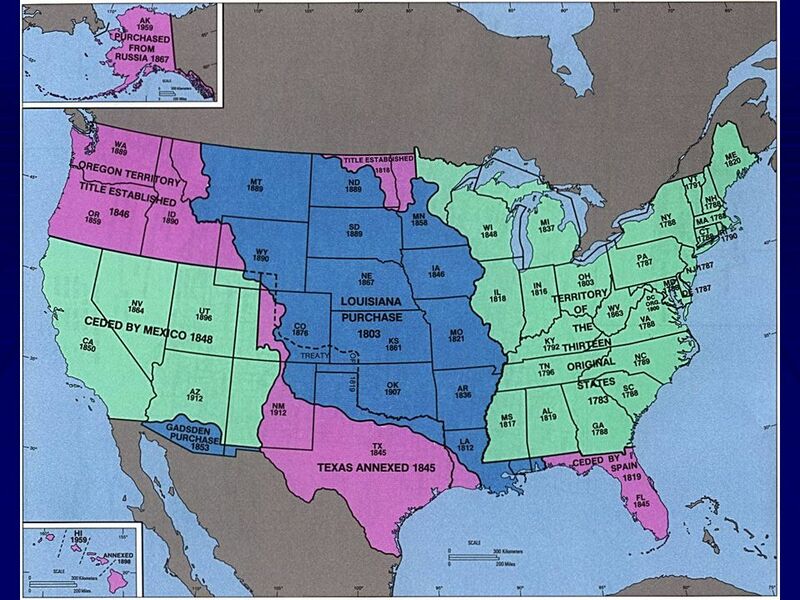 T HE F RENCH REVOLUTION BEGINS During this same time, American Revolution New America was formed Two. The French Revolution and NapoleonSection 1. The French Revolution and NapoleonSection 1 Main Idea Problems in French society led to a revolution, the. 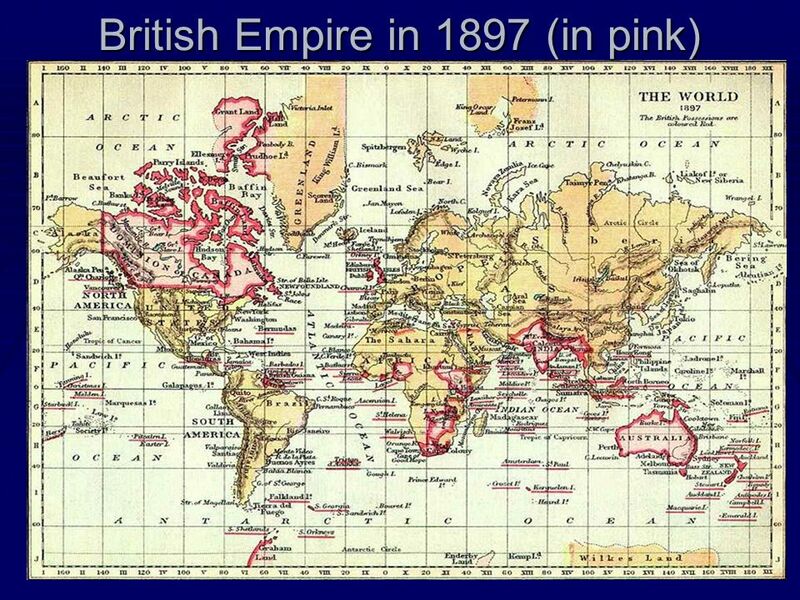 AP World History POD #19 – Revolutions in Europe The Old Regime. 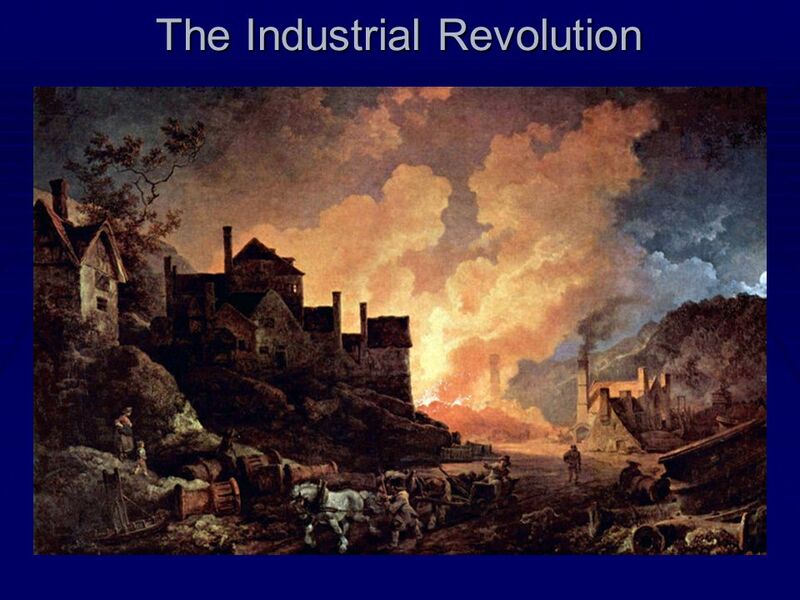 EUROPE REVIEW MIDDLE AGES TO THE INDUSTRIAL REVOLUTION.